First of all, happy pi day! 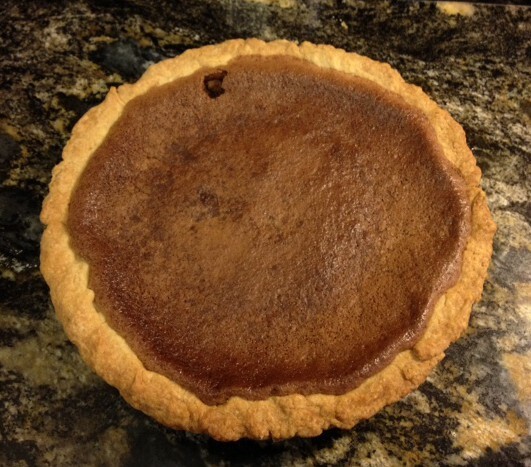 Two quick and easy pies this year: a chocolate chip cookie pie and a bittersweet chocolate pie on a coconut crust. The former is for my two teenage sons and the latter is for my husband and me (we are doing gluten-free and low sugar these days). Here’s a couple of pictures and the basic recipes. Heat oven to 325 degrees. Butter an 8 inch pie plate. Beat eggs until frothy. Add in flour, brown sugar, and sugar. Mix in butter. Add chocolate chips. Spread in pie plate and bake for 35-45 minutes. Serve warm or cool. Coconut crust: Mix 1-1/2 cups coconut (I used half unsweetened and half sweetened) with 3 tablespoons of butter. Press into an 8 or 9 inch pie plate and bake at 325 degrees F for 15 minutes. Cool crust, then fill with a round of bittersweet chocolate pudding and chill. Serve with whipped cream. I was really looking forward to this week of skating, since I am on spring break. Last week I finally got my skates sharpened and was feeling pretty good. But wouldn’t you know it, last Thursday I was doing power pulls on my newly sharpened skates and caught an edge. Down I fell! and bruised my tailbone and right thigh this time. Fortunately this was not as bad as the bruise I got in January, but it is enough to make me contemplate wearing pads. Ouch redux! So I have been a little tentative on my right side this week (maybe this will force me to work harder on my left side). I have also gotten behind on this blog because even thinking about skating made me feel more bruised. I am feeling much better today. Pi(e) helps! Everyone has grief and pain sometimes. But not everyone celebrates January 25, Bobby Burns Day, with the dread haggis. I’ll take pie anytime! Categories: recipes, skating poems | Tags: adult figure skating, adult skating | Permalink. And alignment and edge quality! Categories: happy skating, skating poems | Tags: adult figure skating, adult skating | Permalink. Cool, huh? Notice how there is no wasted motion here. The other thing I found was an article called “The Anatomy of Speed Skating” from an issue of Popular Science Monthly from December 1895. 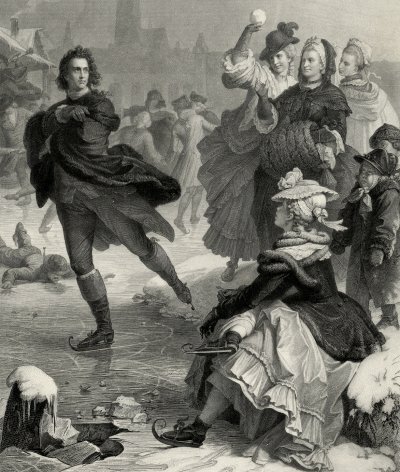 It begins with a reference to the German writer Johann Wolfgang von Goethe, who enjoyed skating. Here’s a picture of Goethe on skates, looking very much the manly skater on the cusp of German Romanticism (hips forward and tailbone down). I feel like I should be one of that smiling trio of women ready to chuck a snowball at him. 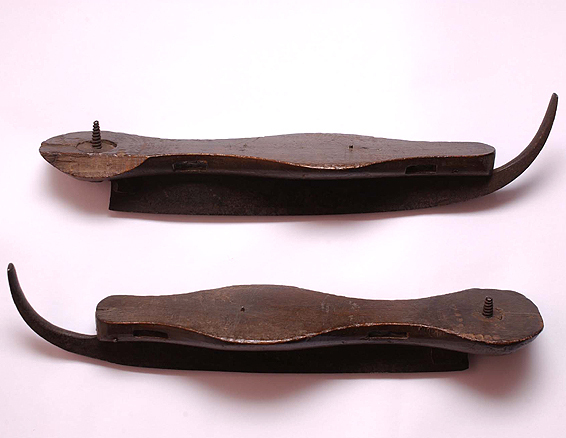 And here’s Wordsworth’s skates, preserved for posterity in the Wordsworth Museum and immortalized by the great contemporary poet Seamus Heaney in his poem “Wordsworth’s Skates,” from his 2006 poetry collection District and Circle. The rest of the essay describes the accomplishments of some of the fastest speed skaters of this time (John S. Johnson [of Minneapolis! ], Olaf Nortwedt, Adolph Norsing, and J.K. McCulloch) but also focuses on how these men have developed skeletal and muscular problems from the over-development of certain muscles and the neglect of others. It gives careful details on anatomical features, diet, and training habits of speed skaters from the U.S., Canada, and Norway. It concludes that some of these men have developed a “bicycle stoop” and have poorly developed arms while others, who have supplemented skating with gymnastics, have much better upper body development and symmetry. Hmmm. . . they looked okay to me. And admiring their skating musculature certainly made for a nice change from all that poetry! Eva asked for Harriet’s rhubarb pie recipe, so I thought I’d post both that one and the one for my friend Carol’s deep fudge pie. These are a few of my favorite pies. Raspberry, blueberry, all berries will do it. These are a few of my favorite pies! Make pie crust in a food processor by cutting a cubed stick (1/2 c) of butter into a cup of flour, salt, and a tablespoon of sugar, then adding ice water until the whole thing comes together into a ball. Refrigerate for 15 minutes and then roll out into a 9″ pie pan. Prick pie crust with fork. Bake in 400 degree oven 10 minutes or until golden. Meanwhile, melt chocolate with butter over hot water or in microwave. Cool slightly. Beat eggs until light and fluffy. Slowly beat in corn syrup, sugar, salt, and vanilla. Beat in cooled chocolate mixture; blend well. Pour into pie shell. Bake in 350 degree oven for 25-30 minutes or until top is crusty and filling is set around edges (Do not overbake; the pie should still be soft in the middle.) Cool on rack. Serve with vanilla ice cream or whipped cream. Crust: Mix flour and confectioner’s sugar and cut in butter/margarine with a pastry blender (or you can use the food processor to first cut in the butter and then add a few tablespoons of ice water until the mixture forms a ball). Press mixture into a 9 or 10 inch pie pan (10 if 4 cups rhubarb used). Bake 15 minutes at 350 degrees. Pie: Beat eggs and stir in sugar, salt and flour. 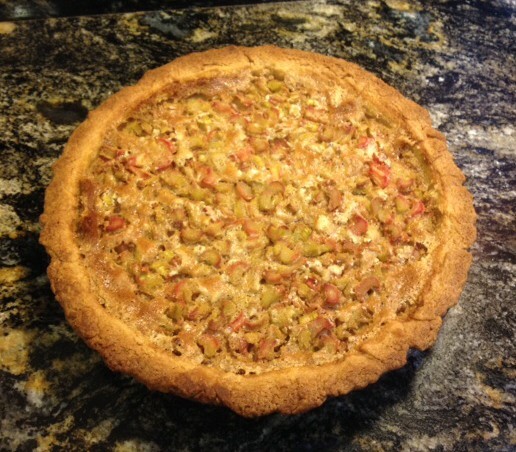 Mix in rhubarb and spoon into the hot crust. Bake at 350 degrees 50 to 55 min. until top starts to brown lightly. Serve hot or cold. Categories: recipes, skating poems | Tags: pie recipes | Permalink. That’s an easy one. Here’s my answer, a tribute to her inspiring meditation on watching a grasshopper (lines in italics are hers). Who made this three, and these bunny ears? heart pumping, ankles pressed against laces, then releasing. I can see my own reflection going to and from the boards. Now I am turning my hips against my shoulders and feeling tension deep deep down. Now I change direction, head stays the same. Count with me–one, two, three. to signal us off and away, no moment when the music stops. This is what I’ve been doing during those few hours. Categories: happy skating, skating poems | Tags: adult figure skating, adult skating, national poetry month | Permalink. The temperature is now above 40 degrees, and everything is melting! In honor of the arrival of warmer weather (here in Minnesota we don’t say “spring” until May), I want to share a couple of poems and a few photos about ice. They will pull your rain gutters down! and up behind your roof shingles. Next thing you know, it’s raining in the kitchen! to have the worst one that year. to follow, often with the dog, nose to ground. But icicles—they are not our friends. Get a roof rake and make them vanish, and soon! But to prove that we do love our winters (at least for a while), here are some pictures from earlier this year: an annual cross-country ski race that always involves decorating a frozen lake with ice sculptures and lights. Enjoy! Categories: happy skating, skating poems | Tags: ice sculptures, poems | Permalink. At my lesson this week, Ari had me doing the side pattern from the European Waltz. We’ve been working on the man’s part for so long that it took me a few tries to get back into the woman’s steps. And then I realized how much repressed trauma can be buried under my smooth mask of skating joy and calm. OMG, not the European Waltz! The dance that shall not be named! It was the first compulsory ice dance that I ever failed. I passed it on the fourth try, only because (a) I took enough cold medicine (for a bad cold, I swear) to put myself into a kind of altered state, and (b) I watched Torvill and Dean’s legendary Paso Doble OSP on television (yes, it was that long ago) right before the test. The European Waltz is pretty much three-turn city. The pattern goes something like this: left three turn, back outside right, back outside left, step forward to right three turn, back outside left, back outside right, repeat the whole thing, then do three repetitions of a three-turn-to-back-outside-edge. The test requires three patterns, not short and definitely not sweet. It goes round and round the rink for what feels like forever. Oomph pah pah, oomph pah pah, threatening imminent doom with every pulse of 3/4 time. After I passed, I thought with relief that I’d never have to work on it again. But oooohhh nooo. . . . to progress further on the pre-gold dances I am faced with the brutal reality of the Starlight Waltz end pattern, which has two of those end pattern Euro-threes capped off by the oh-so-delightful foxtrot mohawk. Had I passed my pre-golds soon after my silvers, I might have been spared testing the Starlight Waltz, which some years ago was made into a pre-gold dance (when I started ice dancing, it was tested at the international level, after the gold-level dances). But I took a set of breaks from skating, and a long long break from testing after doing the silvers. I actually do like the Starlight, aside from those wicked three turns. The repetitive three turns make European Waltz harder, because for me it’s like repeating the same mistake again and again and again. And again. Both my three turns and back outside edges are problematic. Luckily, it’s the same basic challenge with both: not using the inside edge to lower myself down on the knee, and not placing the new foot on the ice. Unluckily, this causes the same problems: instead of lowering on the inside edge, I’ve been falling into the circle on my three turns (not lifting my heel), not lowering down but falling from the inside edge onto the back outside edge. I’ve also been sliding my feet from outside to outside on the transitions, missing those loveable “rockover” inside edges at the end of each outside edge. I need to work on controlling those inside edges in order to create a genuine, bona fide (really, truly, madly, deeply) push from one edge to another. and thinking to myself, yeah, right. I’m not sure I am conveying the proper tone of optimism about this process. So in the spirit of a modern dance teacher I once had who said “Your weaknesses become your strengths,” I am trying to stay upbeat and just keep at it. One back edge, and a three. Categories: compulsory ice dances, skating poems | Tags: adult figure skating, adult skating | Permalink.